Browse our large collection of classic round cut solitaire diamond engagement rings to find your perfect ring. This classic cut is still as popular as ever. Round Brilliant Cut is a classic shape that is loved by all. A Round brilliant consists of an average of 58 facets, which maximize the amount of light that the stone gives off. At CaratDirect2U we carry a large stock of 0.25-3.00 carat stones in a large variety of color, clarity r and cuts including: ideal, very good, good and fair. We pride ourselves in holding a large selection of Hearts & Arrows diamonds that are certified by EGL USA and GIA. We also offer stones that are K.M treated, or clarity enhanced for those looking for a better price on a diamond. 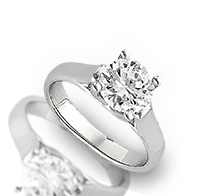 All of our engagement rings come in a range of settings such as Bazel Settings, Tiffany Settings and many others. All of our rings are in 14k or 18k gold, some in white gold some in yellow and some in two tone. All of our diamonds are conflict free.